Voile curtains make a fantastic alternative to net curtains. Like nets, they’re semi-transparent, so offer both privacy and natural light distribution. However, thanks to their woven construction, they tend to look much smoother. What’s more, they often feature stunning patterns (though if you’d prefer to keep it simple, some come with no pattern at all). We’ve penned another article on the subject of what voile curtains are, so we won’t repeat ourselves here. 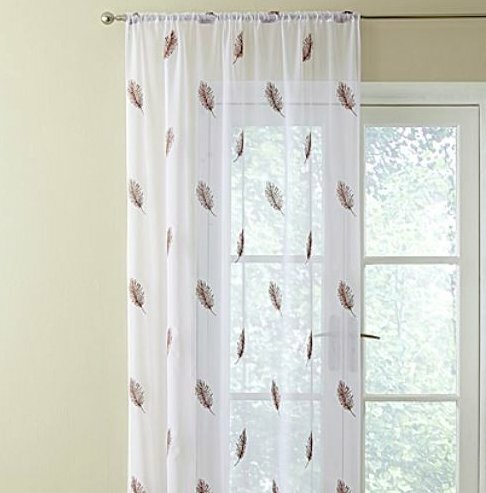 Here’s how to hang voile curtains. Let’s run through a few ideas for hanging voiles. One of the most popular ways to hang voile curtains is to have two voiles meet in the centre of the window. If you like the way that yours look, you won’t need to add any more treatment at all! If you’re dressing a smaller window, then it might not make much sense to have voiles hung on both sides. This is especially true if you have two smaller windows on either side of a room; perhaps with a feature in the middle. Just one curtain hanging from the side helps neaten things up. Voiles come in many different colours. For an unusual effect, try alternating voiles of two or three colours. Voiles offer a number of key advantages, but they can’t exclude light, and they offer negligible sound and heat insulation. You might get around these flaws by using both voile curtains and a heavier set of blackout curtains. Do this either on a two-rail system, with voiles set behind the heavy curtains, or by setting the voiles inside the window itself. For a thicker effect, you might choose to hang two sets of voiles across the same space using a pair of rods. Picking two different colours can be effective here – you might choose something darker on the outside and something lighter on the inside, or opt for contrasting patterns. Alternatively you might choose two matching sets of voiles, for a thicker effect. If you’re just buying a voile for its decorative effect, then you might not have it hang over the glass at all; instead, wrap it around the rail and allow the two ends to fall on either side. Done right, this is ideal for complementing a set of blinds. This is one of the more unusual ways to hang voile curtains, but it’s one that can create striking visual appeal while obtaining the practical advantages of a different set of curtains. However you decide to hang your voile curtains, you’ll want to ensure you have enough gather that they aren’t pulled fully taut – this is rarely a good look. As a rule of thumb, your voile curtains should measure double the width of the window. Shop our full range of voiles here.